Chorizo is a type of sausage often used in Spanish and Mexican cuisine. It is made from coarsely chopped pork and red pepper, with chili pepper and paprika as a seasoning. Chorizo ranges from a mild heat to intensely spicy, depending on the brand or recipe. Chorizo is available fresh, which requires cooking, or dry cured, which does not. Fresh chorizo sausage can be prepared using a variety of methods. Preheat your grill to a medium-high heat, or about 375 degrees Fahrenheit. Place whole chorizo sausages on the grill lengthwise across the grates to create grill marks. Grill the sausage for roughly 15 minutes, until they are browned on the outside and cooked through. Turn your sausages every few minutes with tongs during grilling. Chorizo sausage can be basted with sauces, as desired. Heat a skillet to medium heat and add 1 tbsp. of olive oil. Add whole chorizo sausage to the pan and cook for eight to 10 minutes, until browned and cooked mostly through. Add 1 cup of wine or other sauce to the skillet and continue to cook for about three minutes longer. Cut your sausages into 1-inch slices prior to cooking in the skillet for an attractive presentation. 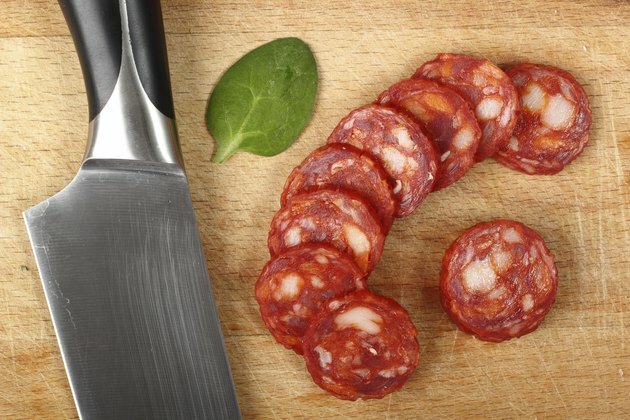 Remove the casing of fresh chorizo sausage by sliding the tip of a sharp knife down the length and pulling the meat out. Cook the sausage meat in a skillet over medium heat, until it is browned. Add the browned chorizo meat to a baking dish with grated cheese, canned tomatoes or other ingredients. Bake at 400 degrees Fahrenheit for 20 minutes and then remove it and wrap the mixture inside a flour tortilla. Chorizo sausage meat or sliced chorizo may also be added to pasta sauce.